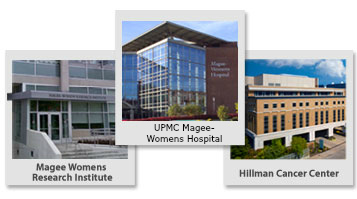 The Women’s Cancer Research Center (WCRC) was developed in 2010 as a unique collaboration between the UPMC Hillman Cancer Center (Hillman) and the Magee-Womens Research Institute (MWRI). As the only NCI-designated comprehensive cancer center in western Pennsylvania, Hillman is a recognized leader in providing innovative cancer prevention, detection, diagnosis, and treatment; biomedical research; compassionate patient care and support; and community-based outreach services. MWRI was established in 1992 as an independent research institute and the research arm of the Department of Obstetrics, Gynecology & Reproductive Sciences of the University of Pittsburgh. 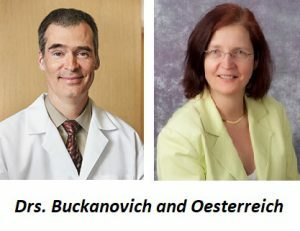 The WCRC is co-directed by Ronald Buckanovich MD, PhD and Steffi Oesterreich, PhD. The Educational program is directed by Steffi Oesterreich, PhD. The WCRC is comprised of primary and secondary faculty who are actively involved in women’s cancer research. Members have a diverse array of interests in women’s cancer research reflected by their participation in multiple Departments including Pathology, Medicine, Pharmacology and Chemical Biology, Surgery, Ob/Gyn and Reproductive Services, Psychiatry, Biomedical Informatics, Radiology, Medical Education, Biostatistics, Epidemiology, Microbiology and Molecular Genetics, Hematology/oncology, Health Science, Cell Biology and Physiology, Bioengineering and Pharmaceutical Science. Members of the WCRC have numerous publications in high-impact journals, and currently receive funding from the National Cancer Institute, Department of Defense, and Susan G. Komen for the Cure. WCRC members perform research in multiple locations in Pittsburgh including the Oakland and Hillman campuses. The main laboratory research location is the 4th floor of MWRI at 204 Craft Avenue. Patient-based research is conducted primarily at Magee-Womens Hospital, the Hillman Cancer Center, and other UPMC clinical facilities. The close location between MWRI, MWH, and Hillman fosters unique opportunities for collaboration among investigators and it provides an extremely rich environment for educational and training programs.